The Lodhi hotel is gradually coming out of its lull. After years of exchange of ownership – it is presently with DLF – the property is opening up, offering guests and visitors more exciting experiences. Part of it are their contemporary and world-class restaurants. In 2017, it became the new home of Indian Accent, and just a month ago, threw open the doors to Perbacco, headed by Michelin-starred chef Adriano Baldassarre. A confluence of flavours from various regions of Italy, the restaurant is part of Lodhi’s General Manager Vikramaditya Singh’s plan to turn around the hotel’s image. 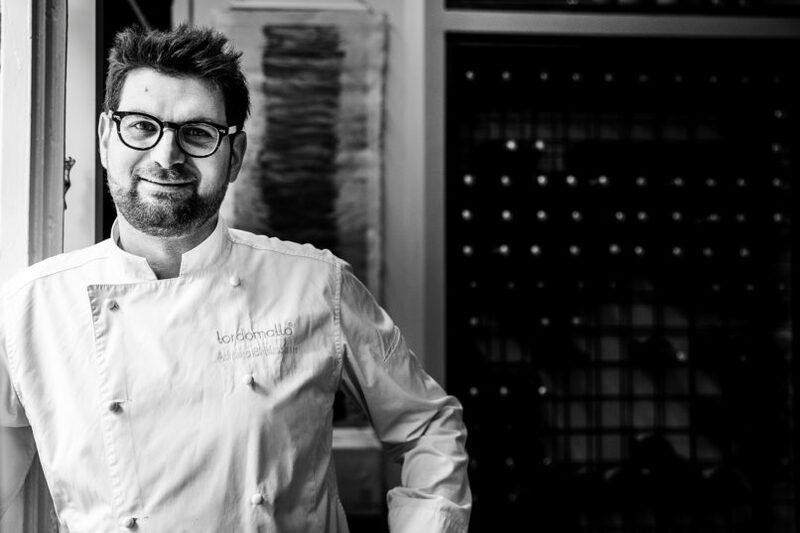 Baldassarre, who runs a one Michelin starred restaurant in Rome, will divide his time between India and Italy, and is keen on introducing Italian cuisine beyond the pizzas and pastas that have come to define it. Large windows allowing for ample sunlight, bright interiors in aqua and white — with the service staff’s ensemble complementing it, you’ll be reminded of sunny Tuscany. 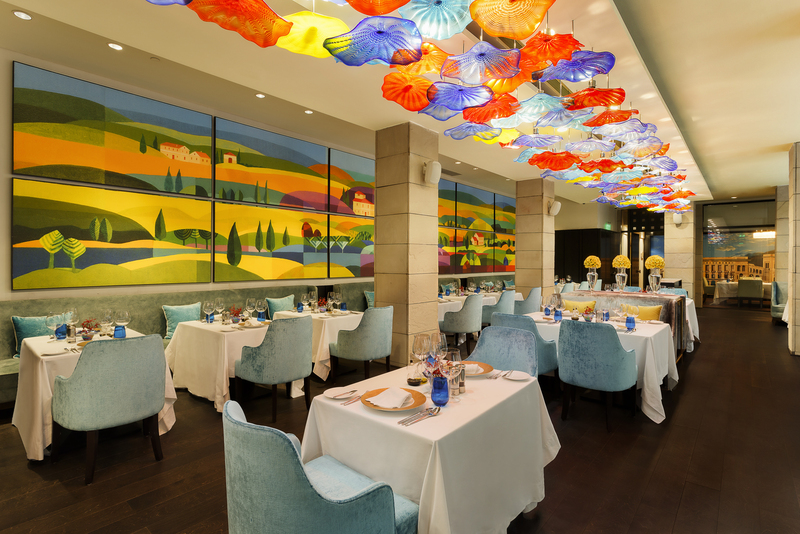 The multi-coloured glass installation along the ceiling adds to this character. The lower ground floor is perfect for a peaceful meal, sans the noise of the capital, and the lounge chairs and large tables comfortably transition from lunch meetings seating to family suppers. 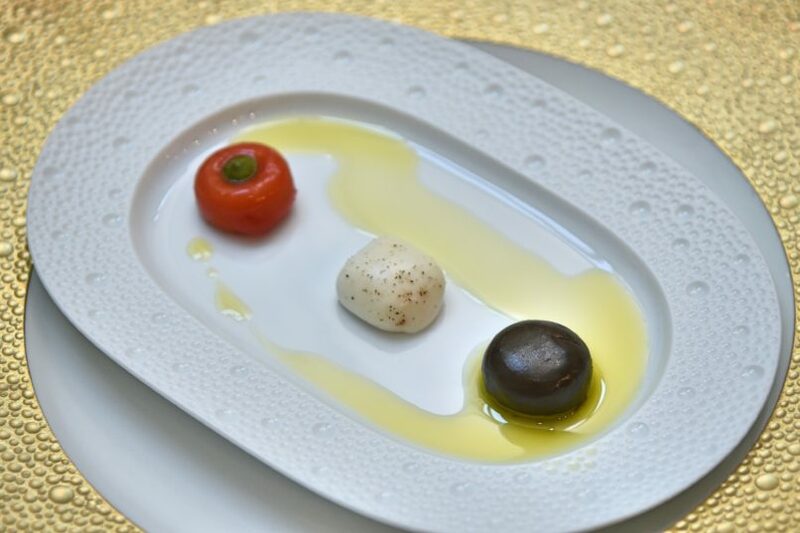 The amuse bouche of three bites each of mozzarella, olive, and tomato are a refreshing start, the house-made cheese bursting with flavour. A moving antipasti platter follows, with cold cuts of aubergine, onion, three kinds of olives, mushrooms, zucchini, and bell peppers. These are flavoursome, but could carry more of the crunch expected of vegetables. The Panko Crusted Lamb balls are melt-in-your-mouth treats. It features the softest shredded lamb with a hint of sour from pecorino cheese, the crunch from the panko crust rounding off the balanced dish. The Tomato Mozzarella Basil salad features exactly those three things. While the freshness of produce shines, the take on these classic flavours could be more innovative. Eggplant Parmigiana and Pesto Pasta are nicely done, bringing out their respective taste. The eggplant comes through the parmesan, bread crumbs, tomatoes, and bell peppers, creating a sweet palate that doesn’t get overbearing as it’s cut by the slight bitterness. The pasta is al dente and a display of their expertly done pesto sauce, carrying lots of garlic, basil, nuts, olive oil, and cheese. The Lamb Cannelloni is the winner, with the soft meat making a reappearance, paired with delicate, rolled lasagna sheets, and garden-fresh tomato sauce. While the setup is simple, it has been cooked skillfully so you don’t feel the need for any condiments. Another lamb dish (perhaps the chef’s favourite meat? ), the Lamb Chops have meat falling off the bone. However, the accompanying mashed potatoes are a tad bitter, and may be better with the creamy, faintly sweet profile. The Tiramisu is as perfect as one would expect from an Italian chef. A perfect pick-me-up dessert, its mélange of espresso, cocoa, biscuit bits, mascarpone cheese, and wine is a winner. The Baba Au Rhum, while a little too high on rum, making the sponge cake a bitter bite, is accompanied by fresh strawberries and blueberries, which balance it out if you have a high tolerance for the initial acridity. 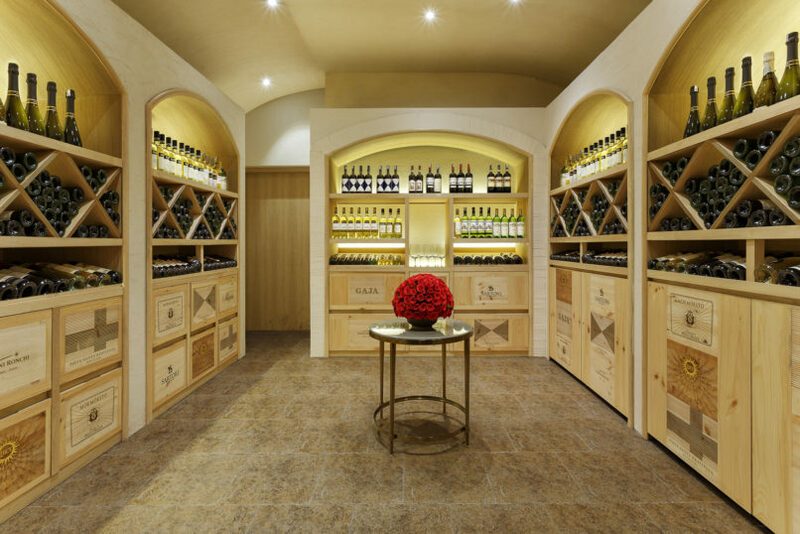 You can pair the meals with The Lodhi’s wine collection. Also, don’t forget to sip on their water – infused with alkylates, it’s healthy and helps keep diseases like cancer at bay. The chef does successfully take one’s mind off the typical Italian dishes and brings a mix of the comfort fare as well new entries to the table. Italian flavours are already a hit amongst Indians, and Perbacco furthers that by extracting those and making a single ingredient the hero of the dish. Simple, expertly done, and flavourful is what defines the menu.